Rudy N. Lea, Sr., Founder and President of Lea Funeral Home and Cremation Services, has been a very active and supportive member of the Raleigh community for more than thirty years. A native of Burlington, NC, Mr. Lea chartered his professional course starting as early has his high school years. After graduating from high school, Mr. Lea enrolled in the Pittsburgh Institute of Mortuary, Pittsburgh, PA, where he was awarded the Associate of Arts Degree in Mortuary Science Degree with Honors. He is currently a licensed mortician in both North Carolina and South Carolina. He is also a member of the Advisory Board of the School of Mortuary Science, Fayetteville Technical Community College, and a former member of the North Carolina Commission of Anatomy. 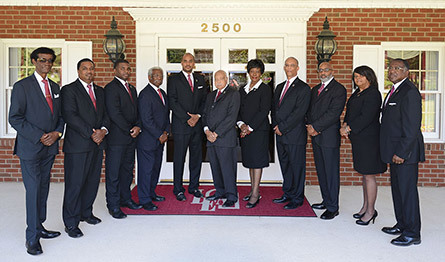 Prior to establishing his own funeral home business in Raleigh in 1980, Mr. Lea served several funeral homes in the area. At one of them, he was the General Manager for ten years. That experience inspired him to act on his vision to build a modern, state-of-the- art funeral home in Southeast Raleigh. Today, his funeral home is recognized as one of the most modern and well-equipped funeral homes in the State. It is a family-owned business with a long history of community service. Mr. Lea takes great pride in offering the community the very best in service and facilities. Mr. Lea is frequently sought as a speaker because of his in-depth knowledge of the funeral business and his expertise as a successful and caring businessman. He has mentored many young people interested in pursuing a career in funeral service. In fact, several, who have started their own businesses, received their training under Mr. Lea’s guidance. Today, many still call him for advice and support. He gives it willingly without any hesitation. Mortuary Science students consider it a professional endorsement to do their apprenticeship with him. Always seeking to improve his operation and that of his others, Mr. Lea personally designed a software program explicitly to manage the day-to-day operations of a funeral home. That program, with a patent pending, is used by funeral homes throughout the country. Mr. Lea is a very quiet and unassuming gentleman who does not seek the limelight. He believes in doing good, helping somebody if he can, and, then, moving on to the next task at hand. Consequently, many of his compassionate deeds often go unheralded. Luckily, some of them, as indicated below, did not go unnoticed. --2010 City of Raleigh Human Relations Committee BUSINESS AWARD for Outstanding Service to the City of Raleigh. -- FREE VANS: Lea Funeral Home rented two 12-passenger vans for the 2008 Obama for President Headquarters. The vans were used to transport voters to the polls. --FREE LUNCHES: During each election, Lea Funeral Home provides free lunches for poll workers at designated voting sites in Southeast Raleigh. --FREE TENTS: Lea Funeral Home erects tents at the Chavis Heights Voting Site to protect workers and voters from inclement weather. -LITTLE LEAGUES: Lea Funeral Home has provided uniforms and equipment for several Little League Teams. --SPECIAL NEEDS CHILDREN: Special Needs children are provided at least 12 tickets to attend the annual AMRAN Shiners’ Circus at the NC State Fairgrounds. FAMILY AND FRIENDS DAY: Food, gifts, games, and fun activities are provided for the entire community at the Family and Friends Day. THANKSGIVING AND CHRISTMAS: The funeral home adopts a family for the holidays. The family is provided groceries for the holiday meal. CANDLELIGHT SERVICE OF REMEMBRANCE: Lea Funeral Home was the pioneer in recognizing the community’ s need for a Candlelight Service of Remembrance. The beautiful, inspiring service is open to the public. Other funeral homes have followed his lead. The Funeral Home contributes to many pastoral and church anniversaries, debutante balls, Blue Revues, fundraisers and scholarship activities. Few in the community know that Mr. Lea is a champion tennis player and plays a mean tenor saxophone. Mr. Lea is a member of the Compassionate Tabernacle of Faith Missionary Baptist Church, where has served a member of the Board of Trustees. He is a member of Widow Son #4 Lodge. The father of four adult children, Mr. Lea is married to Mrs. Lucille Thomas Lea. Mrs. Lucille Thomas Lea is from Raleigh, NC, and spent most of her professional career working abroad at our U.S. Embassies, and in Washington, DC. She considers her work in the field of funeral service to be her calling, a ministry, to be exact, not a second career. Mrs. Lea’s first career was in foreign affairs and international management, where she was a member of the U.S. Department of State’s Foreign Service, Diplomatic Corps. One of the first Black women to pursue a career in the field of diplomacy, Mrs. Lea rose quickly through the ranks from Junior Officer to Senior Foreign Service Officer, one of the highest service designations. Prior to joining the Department of State, Mrs. Lea was a researcher at the U.S. Library of Congress, Washington, D.C. Serving in the Department of State in Washington, D.C. and at U.S. Embassies abroad, she was frequently the most senior ranking minority woman in the country where she was assigned. At the U.S. Embassy in Ottawa, Canada, where she was Minister-Counselor for Administrative Affairs, she managed large, multi-lingual and multi-cultural staffs of four hundred plus, and managed multi-million dollar budgets. Her position required that she travel across Canada from Vancouver in the West to Halifax in the East. She was also the most senior ranking minority at the U..S. Embassy in Santo Domingo, Dominican Republic. Mrs. Lea’s first assignment to the U.S. Embassy in Paris, France was followed by assignments to U.S. Embassies in Tunis, Tunisia, (North Africa), and Dakar, Senegal (West Africa). During her career, Mrs. Lea conducted official diplomatic missions to Egypt, Mexico, Panama, El Salvador, Colombia, Nicaragua, Honduras, Mauritania, Guinea, Guinea-Bissau, Mali, The Gambia, Ivory Coast, Cameroon, Kenya, Rwanda, Burundi, India, Pakistan, Bangladesh, and Nepal. During her visits, she met with senior officials and conducted sensitive briefings. Due to her extensive experience and facility with foreign languages, the Department of State selected Mrs. Lea to attend the prestigious National War College, Defense University, at Fort McNair, Washington, DC. Her classmates included the Secretary of Veterans Affairs, and a former Chairman, Joint Chiefs of Staff. She was the sole Black woman in the class of 186. Mrs. Lea is a graduate of Saint Augustine’s College in Raleigh., NC. She later earned degrees from the John F. Kennedy School of Government at Harvard University, Cambridge, Massachusetts, and the National War College, Fort McNair, Washington, D.C. She also studied abroad at the L’Universite de Lyon in Lyon, France. She speaks French, Spanish and German. Her most endearing memory of her world travels is her private audience with Mother Teresa in Calcutta, India. At home, she is a frequent guest lecturer at Shaw University, Saint Augustine’s University, local high schools and civic organizations. She firmly believes that our young people must embrace the reality of having a global outlook on life and be prepared accordingly. She was a Charter Member of the Advisory Board of International Affairs and Management at North Carolina Central University, Durham, and N.C. She has authored and co-authored numerous articles and is working on her memoirs. How does this tie into the funeral business? Here’s the answer. Mrs. Lea considers it a blessing to be able to use her skills in the funeral service field. Her foreign affairs background has enabled Lea Funeral Home to broaden its services to the growing international community in Raleigh and surrounding areas. She is a strong support for her husband and the funeral home’s community outreach program. The funeral home has served local families originally from Europe, Asia, Africa, South & Central America, and the Caribbean. Today, Lea Funeral Home is recognized as the premier expert in handling State Funerals for dignitaries where attention to detail is critical. That same attention to detail, however, is accorded every family served. A warm, and caring individual, Mrs. Lea believes that we all need a hug and a shoulder to lean on in times of sorrow. Prior to retiring and relocating to Raleigh, she met and married Rudy N. Lea, Sr., President and Founder of Lea Funeral Home in Raleigh. To better understand his field, she enrolled in the University of the District of Columbia’s School of Mortuary Science. She later completed her studies at Fayetteville Technical Community College’s School of Mortuary Science, Fayetteville, NC, graduating with high honors. She is a member of the Capital City Sertoma Club, the Alpha Theta Omega Chapter, Alpha Kappa Alpha, Inc., Harvard University Alumni Triangle Club, Saint Augustine University Alumni, and North Carolina Friends of the Foreign Service, among others. She is the recipient of numerous honors and awards. Mrs. Lea is a member of historic First Baptist Church in downtown Raleigh, where she has served in several church ministries. A lover of music, she sings in the Senior Choir. For a long time, she shared her vocal talents with the Gospel Choir and the Praise Team as well. She has been featured in Cosmopolitan Magazine, Jet Magazine, Who’s Who in American Women, and the Department of State Newsletter. Nathan E. Lea is a proud native of Raleigh NC. He received his early education in the Raleigh Public School System where he attended Powell Elementary School and the renowned J.W Ligon Magnet School. He is an honor graduate of the Oak Ridge Military Academy in Greensboro, NC. Mr. Nathan Lea furthered his education at North Carolina State University, where he was awarded a Bachelor of Science Degree in Business Management, with a concentration in Biology. Having grown up in a family in the funeral service business, Nathan’s interest in funeral service came naturally. Therefore, it was not a surprise to anyone when he decided to pursue studies in that field as well. With his B.S. Degree from North Carolina State University already in hand, he decided to enroll in the School of Mortuary Science at Fayetteville Technical Community College in Fayetteville, NC. He graduated with an Associate’s Degree in Funeral Service. Working under his father’s guidance, he learned what it takes to operate a funeral home on a daily basis. His father, Rudy N. Lea, Sr., Founder and President of Lea Funeral Home in Raleigh, NC, made sure that he worked hard and learned well. Today, Nathan Lea is an experienced, licensed Funeral Director and Embalmer with more than 15 years in the funeral industry. He now holds the title of General Manager at Lea Funeral Home.